(The Strad Magazine). 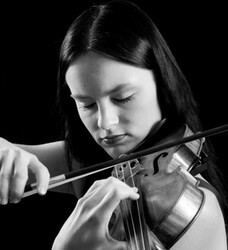 She has performed as a soloist with orchestras in the United States and Europe. Among them are the Magdeburg Philharmonic Orchestra, the Chamber Orchestra Leopoldinum, the Wroclaw Philharmonic Orchestra, the American Academy of Conducting Orchestra at the Aspen Music Festival, the Empire State Sinfonia, the Gateway Classical Music Society Orchestra, the Broadway Bach Ensemble, the Glacier Symphony, and the Augusta Symphony Orchestra. In addition to her many orchestra appearances, she maintains a busy concert schedule as a recitalist and chamber musician with appearances at Carnegie Hall (in both the Stern Auditorium and the Weill Recital Hall), Alice Tully Hall, The Metropolitan Museum of Art, Merkin Hall, The Kosciuszko Foundation, 7 World Trade Center, Bargemusic, Polish and Hungarian Embassies in Washington, DC, The Aspen Music Festival, and the Ethical Society in Philadelphia. She has also performed as a featured artist at music festivals such as the Paderewski Festival, the Sevenars Music Festival, and the Chopin & Friends Festival. Her other recent prestigious collaborations include solo performances with The Jose Limon Dance Company at the Joyce Theater in NYC. Ms. Augustyn is also a member of pianist Jeffrey Biegels Trio 21 with cellist Robert deMaine. The ensemble has recently recorded Glen Rovens Runaway Bunny CD for GPR Records, with Catherine Zeta- Jones as a narrator, as well as Kenneth Fuchs Falling Trio released on Naxos. Ms. Augustyn is committed to increasing awareness of music by Polish composers, as well as promoting contemporary music. She has premiered Michael Whites Sonata for Violin and Piano and his Trio Sonata, which were composed especially for her. She has also recorded his Quartet for Piano and Strings. Ms. Augustyns new album of Polish music will be released on June 1, 2013 on Naxos, and her new contemporary music CD will come out in the Fall of 2013. Augustyns early discography includes Niccolo Paganini 24 Caprices for Solo Violin. Ms. Augustyn has won international awards, including First Prizes at the Alexander & Buono International String Competition (NYC), Artist International Presentations (NYC), J. S. Bach String Competition (Zielona Gora, Poland), and Ackerman Chamber Music Competition at Stony Brook, NY. Other top honors include prizes at the Kosciuszko Foundation Wieniawski Violin Competition (NYC), the Johannes Brahms International Competition (Poertschach, Austria), and the Kloster Schoental International Young Artist Competition (Kloster Scheontal, Germany). Kinga Augustyn began her music studies at the age of seven in her native Poland. She eventually went on to study at The Juilliard School, where she worked with Dorothy DeLay, Cho-Liang Lin, and Naoko Tanaka, and earned both the Bachelor and the Master degrees. She is currently a doctoral candidate at the State University of New York at Stony Brook, where, in the past, she took lessons from Phil Setzer and Pamela Frank. As a teacher, Ms. Augustyn has served as a Violin Faculty for The Alexander & Buono Festival of Music. She has also conducted various violin and chamber music masterclasses and workshops in the United States and Poland.